The SurfaceSWAT — Key Systems, Inc. The SurfaceSWAT™ from Key Systems, Inc. was designed to meet today's security challenges. This emergency entry device grants authorized users access to keys and other small, stored assets. Easy installation, indoor/outdoor use and weather-proof electronics make this product ideal for remote applications. 4.63” wide x 7.63” tall and 3.5” deep. Threaded receivers on back for secure wall mounting. The key pad is capacitance based with no moving parts. It is weather proof and has no moving membrane or mechanical switches to wear out. 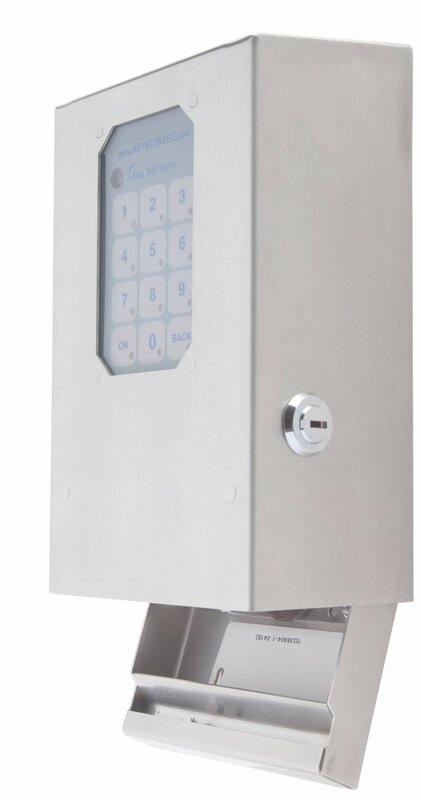 The stored key is retained in an electronic stainless steel vault that is weather proof and vandal resistant. Keypad or card reader user ID gives access to the vault. Vaults can be powered by AC supplies at each device or brought in by POE (Power Over Ethernet). An optional UPS (Uninterruptible Power Supply) can provide standby power during a power failure. Should an emergency release be necessary, the container of the vault can be released using a key. Our central server, Global Facilities Management System™ (GFMS™), is included with the vaults. All vaults are connected to a central database by Ethernet. You manage all your users and vaults with this software. You can set rules as to who can get what when. You can create rules for alarms that can be sent as text messages or emails. GFMS™ is web based and accessible from any authorized web based device.